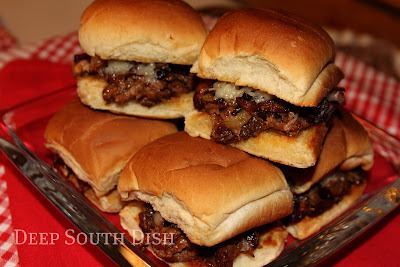 Make Meal #1 of this 3 Envelope Roast a traditional supper of roast & mashed potatoes and Meal #2 can feature these yummy sliders made with caramelized onion and Swiss cheese on toasted buns. A well loved recipe, this Three Envelope Roast could possibly be the easiest roast recipe ever. Made with one envelope of dry onion soup mix, one envelope of dry Italian dressing mix, and one envelope of dry brown gravy mix and a little bit of water - dump it all in a crockpot and that, folks, is it! One of our Facebook readers reminded me of this roast recently, and it'd been awhile since I'd made one. With the big game around the corner, I thought it'd be a flavorful roast to use to make some roast beef sliders. Just as I was about to put this roast in the crockpot, the doorbell rang and the UPS guy handed me a box containing samples of Pace Picante Sauce, courtesy of the Foodbuzz Tastemaker program. I wondered if adding picante sauce to this already flavorful roast could possibly transform it even further. In case you missed it, the other jar was used to make a terrific Picante Shrimp Dip, using some leftover shrimp from the New Orleans Style BBQ Shrimp I had just made. The dip was amazing and I loved the added flavor from the Pace Picante Sauce. I stuck the chuck roast in the crockpot, though any braising roast will do, then whisked together those three envelopes with a cup of water and poured it over and around the roast. Then all I had to do was pop the lid on the Pace Picante Sauce. You could also sear your roast first if you like - I didn't. Pour the picante sauce right on top, cover and cook the roast on low for about 8 hours, or until the roast is fork tender. Time is gonna depend on the size of your roast, and the efficiency of your crockpot. Of course, y'all know that meal number one out of this recipe had to be a plate of roast with mashed potatoes and gravy. For the gravy, I poured off the pan sauce into a saucepan, just so that I could get it heated faster. Added a slurry of 1 tablespoon of cornstarch with just a enough water to loosen it, bring to a boil and then simmer for a few minutes. The Pace Picante Sauce worked well with this roast and I liked the additional tang of it. The Cajun said the roast was so tender you could "cut it with a spoon." Just marvelous. The leftovers went into the fridge to make meal number two sliders the next day. If you want intentional leftovers for the sliders, purchase a slightly large roast. 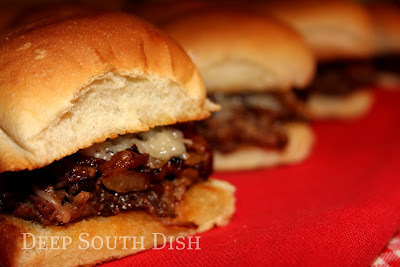 Now... for the sliders, I decided to add some caramelized onion. Glad I did. Despite the fact that the roast was cooked with an envelope of onion soup mix, the caramelized onions were a perfect accent for the sliders. While the onions were going, I toasted the rolls in the oven. I just used a package of split dinner rolls. Then I finely grated some Swiss cheese. I thought the fine shred would work better than slices on these mini sandwiches. I then gently warmed up the beef in the microwave and pulled it apart with a fork to shred it. Remember the beef is already cooked so you don't want to overcook it. Just use the warm or low setting on your microwave to take the chill off. Pile the beef on the toasted buns and top with a pinch of the caramelized onion. Pile on a little bit of the shredded cheese and top the sliders. I wrapped the whole tray tightly with foil and returned it to the oven just long enough to melt the cheese. You could also run them through the microwave for a few seconds to melt the cheese if you prefer. Stack 'em up and pass 'em out while they are still warm - though they are pretty darned good even at room temperature. I only made a half dozen here - you know, just for testing purposes. You can make as many as you have the roast left for! One important thing to note here. Since this roast recipe is based on the use of convenience products, don't be tempted to add any additional salt or other seasonings. Additionally, you would likely want to avoid this recipe altogether if you are on a sodium restricted diet, since there is just no way to reduce the sodium in these packaged products, except to make your own copycat replacements of each of these envelope packets. For more of my favorite slow cooker recipes, visit my page on Pinterest! Whisk together the water with ingredients from all 3 of the envelopes. Pour about 1/4 cup of the liquid on the bottom of the crockpot, place the roast on top. Don't be tempted to season the roast. There is plenty of salt and other seasonings in these envelopes. Pour the remaining liquid mixture all over the top and all around the roast. Pour the jar of picante sauce on top of the roast, cover and cook on low for 8 hours, or on high 4 to 5 hours. To thicken gravy, remove the roast and tent with foil to keep warm. Carefully transfer the contents of the crockpot to a saucepan and stir in a slurry of one tablespoon of cornstarch with just enough water to loosen. Stir into the sauce, bring up to a boil, reduce and simmer until thickened. Cook's Notes: Use a larger roast for planned leftovers. Can use any appropriate braising beef roast including eye or bottom round steak (not top round), rump, shoulder, arm or blade pot roast. Also works nicely with cube steaks (cook on low for about 4 hours). May also substitute salsa for the picante if you prefer, or simply omit it. The traditional 3 envelope roast uses a brown gravy mix, Ranch dressing mix and Italian dressing mix and does not use picante sauce. 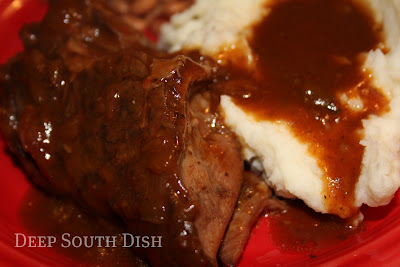 "Mississippi Roast" Variation: Use one envelope of brown gravy or au jus gravy mix with one envelope of Ranch dressing mix. This recipe calls to sprinkle the envelope contents over the roast and top with a stick of butter, but I don't find the added fat necessary when using a chuck roast, so I omit that and substitute a cup of water. Whisk the contents of the envelopes with the water and pour over the roast. Add 5 whole pepperoncini peppers to the top of the roast, cover and cook on low for 8 hours, or on high 4 to 5 hours. To Make Sliders: Preheat oven to 400 degrees F. Butter the insides of dinner rolls and toast, butter side down, on a baking sheet in the oven just until warmed through and browned on the bottoms. Meanwhile in a skillet, caramelize a sliced onion in a tablespoon of canola oil and one tablespoon of butter. While onions are browning, use the lowest setting on the microwave to gently warm the leftover beef, just enough to take the chill off. Use a fork to shred the meat. Place a scoop of beef on the bottom half of dinner rolls, then top with caramelized onion, and some finely shredded Swiss cheese. If you like, stack all the sliders back on the baking sheet and cover the whole pan tightly with aluminum foil. Return to the oven just long enough to melt the cheese. Stack the sliders on a platter and serve with condiments at the table or with a nice sauce like a Sour Cream Horseradish Sauce. Sharing with Whatcha Crockin’ Week 44! Disclosure: As part of the Foodbuzz Tastemaker Program, I received a free sample of PACE Picante Sauce. 52 HUNGRY PEOPLE COMMENTED. ADD YOURS! The toasted rolls just add to a great slider! And this looks like a great slider. Now if I can just have some leftover roast! lol It's my daughter's favorite. Oh yum, the roast and sliders looks delicious and comforting Mary. This is a wonderful, easy meal.Thanks! Oh man, those sliders sound SO good, especially with the onions added! I may have to add this to our menu soon! Sounds fantastic! Think I'll add these to this weekend's menu! Thanks for posting! Oh my goodness, I'd love to add this to my superbowl line up too! The roast as sliders is a great idea! I might have to try that on Sunday! My mom made a roast in the crockpot that was similar to this one, but she used one can of rotel and one can of cream of mushroom soup. It has a nice kick, but I usually use the mild rotel for my kiddos. Those sliders look soooooo goood! YUM! I will be serving these Super Bowl Night! This looks delicious both ways!! But I especially want to try the sliders:) Printed!!! I never make a roast without those three envelopes and a couple of cups of grape or apple juice. I haven't seen this variation with the salsa. Sounds delicious. Love..love..love..these little roast sliders. Another bookmarked. I like the slider idea. I have a 4.5 lb "chuckie" in the fridge right now and I think I'm going to give it the cowboy dutch oven treatment this afternoon. OMGoodness, Mary!! I am not even sure how I came across your blog...but I am SO glad I did!! All of your recipes look so YUMMY!! I literally sat here for hours yesterday (we had yet another snow day here...UGGHHH!!) looking at all of your recipes. The sliders would be great for tailgating! Mary, about how many sliders do these make? I'd say at least a dozen nicely but I'm sure you could stretch that out. Also depends on the size of the rolls you purchase. This was the best roast beef I've had! Loved it! This was the BEST roast I have ever made!!!! Even my 14 month old devoured it! I've raved and raved on facebook about this already! Directing lots of people to your site:) LOL I didn't do the salsa. I can't wait for sliders tomorrow for dinner!!!!! Best recipe I've found on Pinterest yet! I will never make another roast any other way, ever again! Thank you so much Amanda! It really does make a nice roast doesn't it? Thanks for taking the time to come back and let me know you enjoyed it!! Hi Stephanie! Cut them into larger chunks and add them in the beginning. Believe it or not they take awhile to cook in a slow cooker. I put them into the bottom and put the roast on top anytime I use veggies. You can see an example here with a big pork roast: http://www.deepsouthdish.com/2012/01/slow-cooker-pork-roast-with-vegetables.html (just copy and paste) Hope that helps! Beginner cook here...if I wanted to add potatoes and carrots, when would I do that? YUM! What other kinds of roasts would work? I feel like i never know the difference between cuts of meat. Hey Karyn! You can really get away with a lot in the crockpot with roasts. I like to use chuck, rump, and 7-bone roasts because they are so super tender & flavorful (from the fat) but you can also do a leaner cut like eye of round for instance. The former is more tender and shreddable, while the latter is more sliceable. Same rules don't apply when roasting or braising in the oven though! YUMMOHHHH!!! Made this for enchiladas and it was muy bueno!!! Used the rest for sammies the next day. Not a shred of beef left! Thank you! You're welcome Marcy!! Thanks so much for taking the time to come back and let me know you enjoyed the recipe! Oh my lord!! I made the Pot Roast on Friday and served the sliders on Saturday....the best meals I have made in a long time! My husband and high schooler were fighting over the left over sliders! LOL! Only change I made is I served the sliders on ciabatta rolls, which worked well! There isn't an adjective that can adequately describe how delicious these sammies are, and the gravy is beyond lush!! I have been asked by my husband to make 2 roasts next time, one to eat as a pot roast and one for sliders! Thanks for the great recipe!! You're welcome Delancey! I'm glad it was a hit & thank you for stopping back by to leave a comment and let me know - I appreciate that! Made this for tonight & waiting to see how it will come out. I'm just going to make the whole roast for sandwiches. I have a big crowd & the meat can be heated up for later if there are leftovers. I can't wait to see how it turns out! I made all my own mixes for the beef gravy, onion soup & Italian dressing. It's pretty easy & well worth it. Will save lots and lots of $$$ & healthier as no additives & I used a healthy sea salt. I have a lot of the mixes leftover so can use them again for this or any other recipe. Can't wait to hear what you thought - especially with all homemade mixes! It's really a favorite here Ngoc! I like to buy a good sized roast just so that I can have sandwiches with the leftovers. Thanks so much for taking the time to come back and let me know you enjoyed it - I appreciate that! Quick question for you, and I hope someone sees it in time to answer, but was the roast frozen or thawed? I can't see any mention of it anywhere. Hi Michael! All meats referred to in any of my recipes are raw, unless otherwise noted! Hi Mary, your recipes are the best, we love them in our house. I do intend to make this roast, but we can't get the dry dressing mixes here. Is there anything else I can use in place of it, or could I just leave it out? Or where could I find a recipe to make it? Thanks so much Sandra! They each have their own element they add, but you can make up homemade versions of them, or at least use some of the seasonings. I used the dry onion soup mix, dry Italian dressing mix and a dry brown gravy mix, although the traditional 3 envelope roast used Ranch dressing mix in place of the onion soup mix and does not use picante sauce. For a packet of homemade onion soup mix I have used 3 tablespoons of dried onion flakes, 1 tablespoon of beef base (like Better than Bouillon) or 2 tablespoons of granular beef bouillon, 2 teaspoons of onion powder and 1/4 teaspoon of seasoned salt (like Lawry's). For a packet of homemade Ranch dressing mix, 1 teaspoon of minced onion, 1/2 teaspoon of salt, 1/8 teaspoon of garlic powder and 1/2 tablespoon of dried parsley. For gravy mix, I would just make up a roux for about a cup of homemade gravy using butter, flour and beef broth. Making your own mixes will allow you to make adjustments in that salt in each too. Hope that helps! This is my favorite roast recipe. Love it! It really does make a great roast doesn't it? why doesn't a top round work....just curious? Well, in my personal experience, I find a top round roast to be a little too tender to take well to a long braise. It's a much leaner cut than bottom round which is quite a bit more tough of a cut of meat that takes to a longer braise much better. Although it's better roasted, you can still braise a top round roast but it really likes a much shorter cook than the bottom which LOVES long slow braising, perfect for a crockpot! I am making your 3 envelope roast today. I made a small change. Instead of water, I added a cup of Guiness. Hmmmm, love playing with recipes. Of course plan on mashed and gravy, with steamed carrots. Hot home made bread, and a lemon pound cake for dessert. Sunday dinner! Hi Debi! Wow, you sure made me hungry!! I think that Guinness would be excellent - please let me know how you liked it! Hi there, so glad I found you. Really enjoy your blog and love your recipes. Want to try the three envelope roast nit I'm a little confused. In the ingredient list you list one of the envelopes as dry Onion soup mix, but elsewhere you have changed it to a dry ranch dressing mix. With meat prices being what they are, I want to get it right. The ingredients for the 3 envelopes are the ones listed in the main ingredient list of the recipe. The ranch mix is included in another variation of this recipe called "Mississippi Roast." It actually uses only 2 envelopes and one of them is the ranch. Note though that this 3 envelope roast recipe is my take on the original and others around the internet. The traditional 3 envelope roast uses a brown gravy mix, Ranch dressing mix and Italian dressing mix and does not use picante sauce. I also included that at the bottom of the recipe in the Cook's Notes. In other words, you can't really go wrong using any combination of the mixes!